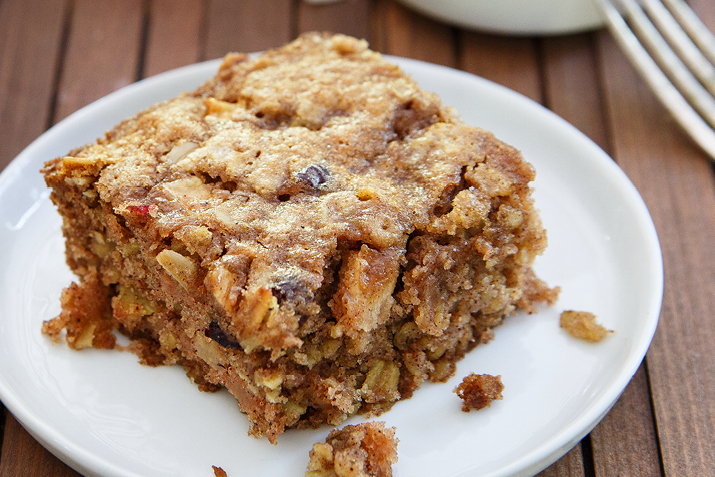 This rich, moist cake featuring sweet apples, dried cranberries and whole grains is sure to please. Heat the oven to 350°F. Butter or oil an 8 x 8 inch pan. In a large mixing bowl, whisk together the flours, oats, baking soda, salt, spices and sugar. Stir in the remaining ingredients until just combined. The batter will be very thick. Spread the batter evenly into the pan. Bake for 35 to 40 minutes or until a toothpick stuck in the middle comes out clean. Let cool before slicing. Topped with whipped cream and served with hot fresh fair trade coffee or tea, this easy cake is sure to please your guests.